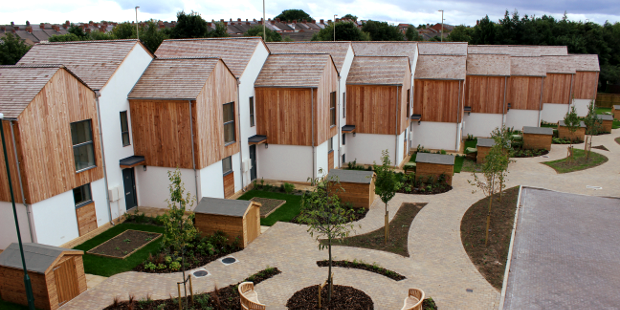 October 2012: Sinclair Meadows the UK’s first carbon negative affordable housing scheme has been unveiled in South Tyneside, North East England, by not-for-profit housing provider Four Housing Group. Sinclair Meadows was purpose designed and built to surpass the Government’s definition of zero carbon and to exceed the minimum requirement for Level 6 of the Code for Sustainable Homes. Narec Distributed Energy, part of the UK’s National Renewable Energy Centre, played a key role in the early research and feasibility stages of this project. Crucial to its success is the engagement and skill training offered to tenants to establish a truly sustainable, vibrant community village that reflects the ethos and aims of the project. The design, technology and tenant training mean that Sinclair Meadows is self-carbon negative and does not require any external offsetting to achieve carbon negativity – the first time this has been achieved for social housing in the UK. The Sinclair Meadows development is home to one of the largest array of photovoltaic modules on domestic dwellings in the UK which reduces demand on traditional energy resources and exports any excess energy back to the grid. From its inception, the project has been focussed on the quality of the building fabric, especially on air tightness and heat loss. The properties have been built using natural materials wherever possible, such as timber frames, hemp insulation and lime render. For the organic fabrics, throughout their growing cycle, these materials have absorbed massive amounts of CO2 which is then locked into the development for the life of the buildings. A detailed energy strategy was developed, considering the positive and negative aspects of all the possible energy solutions which could be used for the development (photovoltaics, solar thermal, wind, ground source heat pumps, air source heat pumps and biomass). This work used the thermal modelling calculations to understand the probably energy demands of Sinclair Meadows. The properties at Sinclair Meadows have been built so that the main habitable rooms are south facing – maximising natural heat and helping residents to save money on energy bills as well as reducing the development’s environmental impact. The heating and hot water will be provided by a communal biomass boiler which will use recycled timber fuel pellets. A rainwater harvesting system ensures rainwater from the roofs of the properties is stored in underground storage tanks – a combined system for the apartments and individual systems for the houses. This water will then be used in the toilets, as well as for gardening at the properties to reduce the amount of mains water used by the residents through everyday activities. The completed homes have energy monitoring systems installed. These allow the occupiers to see the energy that they are using at any one time, and to make informed decisions about reducing their energy use and saving money. Tenants will be extensively trained in how to be energy efficient in their new homes so they have the opportunity to minimise their energy use and maximise savings. Four Housing Group will monitor the energy supplies and will be there to offer ‘green’ advice to residents. The houses will also generate significant revenue returns under the Government’s energy incentives, including the Feed in Tariff and the Renewable Heat Incentive. The development at Sinclair Meadows has received £1.7m in funding from the Homes and Communities Agency (HCA) and has been designed and developed in partnership with a number of key organisations including South Tyneside Council, Groundwork South Tyneside and Newcastle, Fitz Architects, Narec and contractor Galliford Try Partnerships North. ‘Having started working on the project in 2007 we are extremely happy to see the project finished and constructed’. It’s been an exciting experience to be involved in this ground breaking project in what is now our 5th year of business. We have learned so much and feel that the strong concept that won the project competition has been carried through to completion’. Four Housing Group provides affordable homes and quality services which improve the lives of the people who live in them. It does this by creating vibrant, diverse and sustainable communities. As the parent company of Three Rivers Housing Association and Berwick Borough Housing, the Group owns and manage over 5,000 properties across the North East of England stretching from Redcar and Cleveland to Berwick-upon-Tweed. The organisation provides a range of services which give people in the North East choice about where and how they live. Shared ownership housing for sale. For more information on Four Housing Group, its latest developments and services to tenants please visit: www.4hg.co.uk or call 08000 461 452 (free telephone number 24/7). Narec Distributed Energy is part of the UK’s National Renewable Energy Centre, which exists to create a fair low carbon economy. Other parts of the UK National Renewable Energy Centre include Narec, a government funded offshore renewable energy testing centre (www.narec.co.uk ), and Narec Solar, a world leading photovoltaic R&D organisation (www.narecsolar.com).